In the 1700s, Jean-Jacques Rousseau celebrated the Alps as the quintessence of the triumph of nature over the “horrors” of civilization. 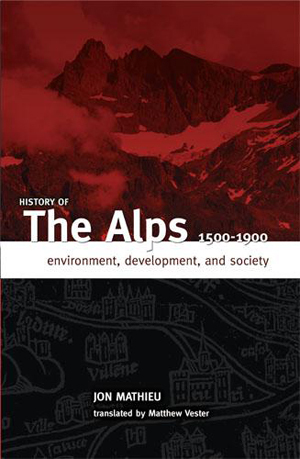 Now available in English, History of the Alps, 1500-1900: Environment, Development, and Society provides a precise history of one of the greatest mountain range systems in the world. Jon Mathieu’s work disproves a number of commonly held notions about the Alps, positioning them as neither an inversion of lowland society nor a world apart with respect to Europe. Mathieu’s broad historical portrait addresses both the economic and sociopolitical—exploring the relationship between population levels, development, and the Alpine environment, as well as the complex links between agrarian structure, society, and the development of modern civilization. More detailed analysis examines the relationship between various agrarian structures and shifting political configurations, several aspects of family history between the late Middle Ages and the turn of the twentieth century, and exploration of the Savoy, Grisons, and Carinthia regions. The Alps: A Historical Space? Jon Mathieu is Professor of History at the University of Lucerne, founding director of the Institute of Alpine History at the University of Lugano (Università della Svizzera Italiana). Matthew Vester is Associate professor in the Department of History at West Virginia University. "...Mathieu has done Alpine studies an immense service, collecting an expansive body of research long divided along national, linguistic, and disciplinary lines. As Mathieu accurately states, 'Quantitative history is sorely missing from Alpine research,' and this slim volume provides a very valuable resource for scholars who wish to redress this lacuna." "Mathieu's book demolishes widespread cliches about the Alps, which seek to portray the Alpine region as the complete reversal of society in lowland areas, or as a world segregated from the rest of Europe."